Remember when a $200 budget used to buy you a metronome and flight case, if you were lucky? Now, you have a range of great synths you can choose from. And now it’s Akai’s turn. The Rhythm Wolf is an integrated analog groove box – a 32-step sequencer, an analog drum machine, and a bassline synth in one. And it’s just $199 street. We’ve got all the details on the box, and should have more hands-on impressions later this week. There are tune knobs for each part, too. The synth bass doesn’t give you too many controls, as it’s wedged into the side of the drum machine. But you do get a square or saw wave, plus a “classic filter design,” with cutoff and resonance, plus tuning and envelope controls. 32 steps with swing. Select patterns, adjust tempo. You can also program in steps via an x0x-style layout. In fact, all in all – and I want to look more into the functionality here – it’s really the sequencing functions that appear to set the Rhythm Wolf apart. 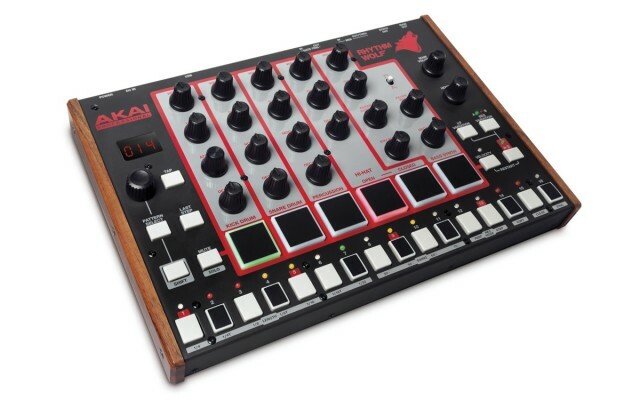 Akai has gone with simplified MPC-style programming, with performance and step recording and even a copy function. That’s not in itself unprecedented, but it’s pretty eye-opening on a $200 box that’s both a drum machine and synth. Add in velocity sensitivity, and you can do things with this box that most inexpensive drum machines can’t (or certainly not without an external input device). There’s also a knob-controlled analog distortion. Effects and so on you’ll have to provide yourself (though having separate synth and drum outs should help), but distortion could be a nice touch as far as adding character. I asked Akai Germany to clarify some features – and it turns out that the pads and sequencing really do add a lot. Akai: Yes. USB and MIDI. Yes, the five pads below the instruments are velocity sensitive. The internal sequencer is able to handle three different layers (values). There’s one mono output from the drums, one mono output from the synth? Ed. : I’m assuming that last bit is unofficial, but… erm… yes, I will make sure we get generous loan terms from AKAI when CDM gets ours to test. “Howl” knob – this is a sort of overdrive? Diode based distortion (preliminary – might change). All analogue as well. No word yet on whether I can chain these together into a Three Wolf Moon. In fact, I’m not sure even how much we get to see in person as there were none in the AKAI booth yet as they were setting up (though I will get hands-on with the new APCs, which are stunningly small). But we have a supply of alcohol near the AKAI/InMusic booth and several days, so who knows what I’ll get out of the product reps by the end of the week.